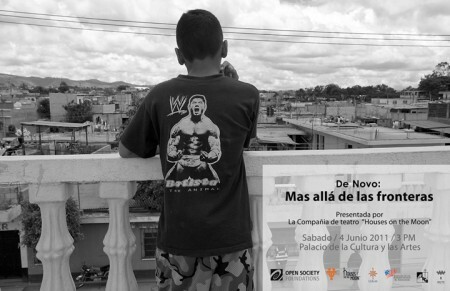 Photographer Donna De Cesare’s exhibition in El Salvador offers a point of view on the lives of Central Americans marked by the war in the past and the uprooting of the present. The exhibition continues in the Museo Tecleño, Santa Tecla, El Salvador till July 31, 2011 It will become part of a permanant collection of the Central American University Jose Simeon Cañas (UCA) afterward. On Sunday June 19, I travelled to Guatemala to participate, as representative of the Dart Center for Journalism and Trauma, in a forum hosted by Interpeace and Sistema de Integración Centroamericana (SICA) concerning media coverage of violence in Central America. I was delighted by the serendipity that on that same day Siglo XXI published a cover story in their Sunday magazine about the accomplished Guatemalan painter Carlos Perez, who I have known for more than a decade. Carlos is one of the young people profiled on this website. His professional growth and incredible achievements are clear evidence that creativity, opportunity and rigorous work transform lives. Too many young people have a fatalistic and lethal lack of hope. Carlos told me that he believed that despite obstacles he could create his own destiny. His actions and achievements have proven the wisdom of his words. 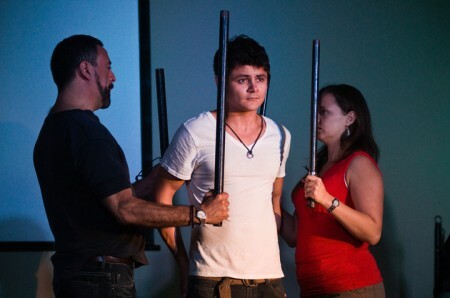 From left, Mauricio Leyton, Arturo Castro and Paola Poucel in the play De Novo. Photo by Joey Castillo. Performances of De Novo, a play by the New York theatrical company Houses on the Moon form a component of an artistic project combining photography, theatre and workshops for youth and university students conceived by professor Donna DeCesare of the University of Texas at Austin and presented in El Salvador June 4-June 10, 2011. Place: Palacio Tecleño, 2º Av. Sur, Calle José Ciriaco López, Santa Tecla. 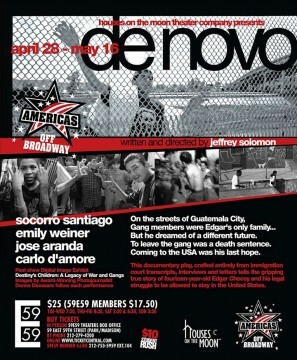 Poster for the production of 'De Novo' in Santa Tecla. Photograph by Donna DeCesare. This theatrical work has been created from court transcriptions, immigration interviews and personal letters that recount the true and harrowing story of Edgar Chocoy, a 14 year old boy and his legal battle to remain in the United States and have different life. 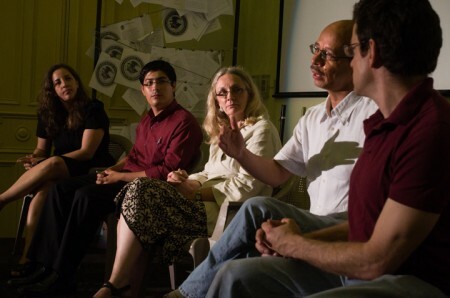 From left: Aryah Somers, Adilio Carillo, Donna DeCesare, Miguel Huezo Mixco & Jeff Solomon. Photo by Joey Castillo. 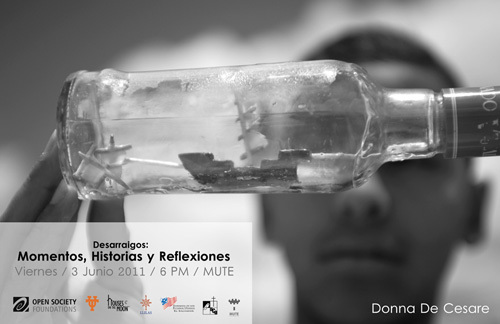 In partnership with Open Society Foundations, the Museo Tecleño and the Universidad Centroamericana, images from Destiny’s Children are currently on display as a part of Donna DeCesare’s photographic exhibition, “Desarraigos: Moments, Histories and Reflections,” in the Museo Tecleño in Santa Tecla, El Salvador. The exhibition brings viewers into realities Central American youth face at home and in the Diaspora. The combination of still photography from the 1980s to the present, and life stories from the website installation Destiny’s Children provoke a reflection about the past and the present and the ways that young people are represented as a consequence of the ongoing process of uprooting. The exhibition will remain on view at the Museo Tecleño from June 3 to July 17, 2011. The Museum is open from Tuesday to Sunday from 9am to 5pm. The exhibition Desarraigos: Moments, Histories and Reflections and the theatrical work De Novo: Beyond borders, by the New York theatrical company Houses on the Moon, are part of an artistic project combining photography, theatre and workshops for youth and university students. 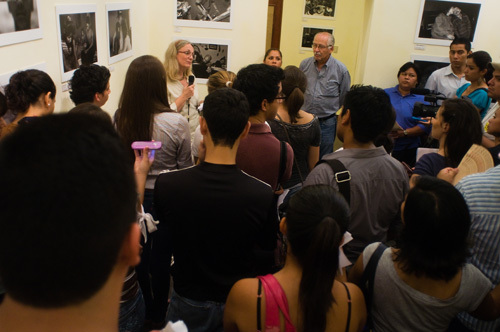 The project, conceived by professor Donna DeCesare of the University of Texas at Austin, has been realized with the collaboration of the Department of Communications and Culture at the Central American University Jose Simeon Cañas (UCA), and with support from the Museo Tecleño, the Palacio Tecleño and the sponsorship of Open Society Foundations. Photographer Donna De Cesare and lawyer Aryah Somers discussed the rights of unaccompanied minors in the US immigration system, the discrimination and danger having tattoos poses for youth deported from the US to Central America, and how photographers earn the trust of vulnerable people in a TALKBACK conversation among the cast and audience following the May 2nd performance of De Novo. In this clip, Donna talks about gaining access and trust of the subjects she photographs. Full audio of the talkback available below the jump. Tickets for the play are still available till May 15th. But he dreamed of a different future. To leave the gang was a death sentence. Coming to the USA was his last hope. In 2007 photographer Donna DeCesare began a collaboration with playwright Jeffrey Solomon and the Houses on the Moon Theatre company to help tell the gripping documentary tale of 14 year old Edgar Chocoy and his legal struggle to be allowed to stay in the United States. The play’s narrative is crafted from documentary elements — immigration transcripts, interviews and letters. The stage design recreates Edgar Chocoy’s world with projections of DeCesare’s haunting photographic images of gang life in Guatemala and Los Angeles. De Novo, Part 1: Lil ‘Silent, reconstructs the poignant true story of Edgar Chocoy’s fate, and a case whose outcome prompted a national outcry and a fundamental reconsideration about the way in which the government handles the many thousands of “alien” minors in immigration custody. Now from April 28th to May 17th, the play which has travelled to law schools and theatre festivals around the country will have its OFF BROADWAY debut, featuring a post-show Digital Image Exhibition from the web project Destiny’s Children: A Legacy of War and Gangs by award-winning Photojournalist Donna DeCesare. UPDATE: Donna DeCesare will participate in a Talk Back after the May 2 performance, which is sponsored by the DART Center for Journalism and Trauma.